Argentinian PA flick EL ETERNAUTA finally going into development? This highly anticipated comic adaptation has been talked about for years now, but now word comes via the production company's Facebook account that it might be going into production soon. While it doesn't provide give any details, the photo on the right was added last Wednesday and is now sitting on the top of the page so we can only hope this means they're now working on it. For those who've missed our multiple news items on this project, we first posted about it back in August of 2008 along with some student project footage, test footage, and a fan based project called Nevada which is currently in development. Yes, this story is quite popular. 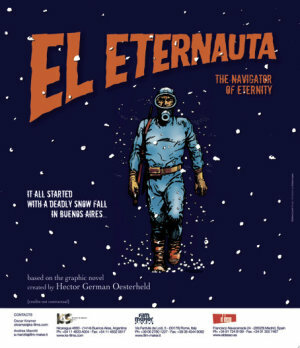 El Eternauta is a sprawling tale that begins with aliens sending a toxic snowfall onto humanity, a devastating attack followed up by their unleashing of bizarre, remotely mind controlled creatures to mop up the survivors. Survivors, who, thanks to the damage wrought on the environment, can now only venture out doors in specially constructed bio-hazard suits. We'll try and get more details for you.